Entrepreneurial, spirited and ambitious, Peter Dillon (1788-1847) spent much of his life as a trader and adventurer in the Pacific region. He learnt several Pacific languages and became familiar with the indigenous peoples of Fiji and the Society Islands. His shipping service between India and Australia provided transport for Samuel Marsden's first missionary voyage to New Zealand in 1814. In 1826-7, through contacts in the Santa Cruz Islands, Dillon located the wrecks of La Perouse's Pacific expedition, unaccounted for since 1788, and recovered articles from them. This earned him a knighthood and annuity from the French government. 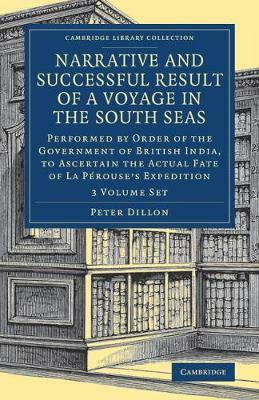 (La Perouse's despatches and La Billardière's account of an earlier search for the wrecks are also reissued in this series.) In this two-volume 1829 publication, which appeared in French and Dutch the following year, Dillon tells the story of his sensational discovery, accompanied by ethnographical descriptions of several Pacific nations.